Anguri Bagh or 'the Grape Garden' is located in front of Jahangir’s Khas Mahal in Agra Fort. 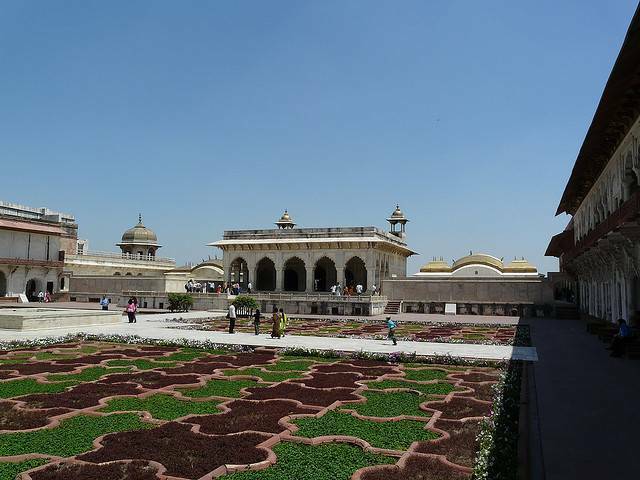 It consists of 85 geometrically symmetrical gardens, with various subdivisions and a fountain in the middle and is divided into four quarters (charbagh). It harvested the finest of grapes and flowers during its peak seasons in the Mughal era brought from outside Agra. Built as an addition by Shah Jahan in the seventeenth century, it was mainly used by the women of the royal household for leisurely strolls and hammams (bath houses) were places in its northeast corner, ensuring complete privacy. The Anguri Bagh is currently not open to the general public. However, it can be viewed from the roofs of the adjoining palaces or from a distance.